I want to cover an issue that seems to always pop up, performing the tie-in on a grid tied solar system. Navigating the rules and regulations for connecting solar to the grid can be a challenge for any designer or installer. The National Electric Code (NEC 2011) is open to interpretation by your inspector, and local jurisdictions often have their own requirements. Local rules and regulations regarding interconnection of solar arrays will always take precedence over the methods I present here, but these are guidelines that will give you a code-compliant interconnection 95% of the time. If you find yourself being questioned by your inspector for connecting the solar system upstream of the main distribution panel (often called a “line side tap”), this article outlines the different systems that are allowed per NEC 2011. Solar is included here because it can operate in parallel with the electrical service as long as the Utility service conductors are sized appropriately. 705.12 - “The output of an interconnected electric power source shall be connected as specified in 705.12(A – D). A & D are the relevant sections for this discussion; B & C are for larger systems with advanced power and safety controls and doesn't apply to residential and light commercial system interconnection. Section A talks about interconnections upstream of the main service disconnect (line side taps). At this point, the only power production source with an over current device is the solar array, so you can connect a system as large as the service, in parallel with your electrical service without modifying anything inside the Main Distribution Panel if desired. Section D is all about connecting your solar system inside the Main Service Panel using a circuit breaker. With 7 sub-sections, it’s easily the most complicated section in article 705.12 Point of Connection. We are mainly concerned with D2, the rest are pretty self-explanatory but I will cover them briefly. This seems to confuse people the most when they attempt to connect a solar system in their Main Panel. Essentially, the solar circuit breaker represents a power source feeding the busbar. Almost always, the only other source of power feeding the Main Panel busbar is utility power via the Main Panel Breaker. For most Main Panels, the busbar rating is equal to the Main Breaker rating. Based on these assumptions (which hold true for the vast majority of grid tied solar installs), an equation for determining if the Main Panel will accept a solar circuit breaker can be made. For most new homes, there’s a 200A Main Panel and 200A Main Breaker. Using our equation, the largest solar circuit breaker would be 200A * 1.2 = 240A – 200A = 40A solar circuit breaker. Dividing by 1.25 (NEC required over current protection factor) gives a maximum solar AC current of 32A for a 200A panel. D1 “Dedicated Over current and Disconnect” – Connect your solar system with a dedicated circuit breaker that has been installed solely for that task. No double duty, tandem breakers with solar and other loads can be used. D3 “Ground Fault Protection” – Today’s grid tied inverters include integrated ground-fault protection equipment so this isn't an issue. D4 “Marking” – Make sure the solar circuit breaker is properly identified at the point of connection. D5 “Suitable for Back feed” – As long as the solar circuit breaker is not marked “line” or “load”, it is suitable for this application. D6 “Fastening” – Usually when you back feed circuit breaker in an AC distribution panel you are required to provide additional fasteners for the circuit breaker on the busbar. This is not the case for circuit breakers from utility-interactive solar inverters, the fastener can be omitted without issue. D7 “Inverter Output Connection” – This states that you always need to install the solar circuit breaker at the opposite end of the busbar from the Main Panel Breaker. For situations where you have a “center-fed” busbar with the Main Breaker in the middle, choose one end of the busbar to install the solar circuit breaker. You want the power sources feeding the busbar at opposite ends for proper flow of electricity. It also talks about panel boards connected in series (Sub panels being fed from the Main Panel). If you connect solar in a sub panel, you only need to make sure you aren't violating the 120% rule for that sub panel’s busbar and conductors. Specific requirements for fastening, marking and labeling your system will come from your Utility/AHJ (Authority Having Jurisdiction, usually the local municipality). Circuit Breaker – Follow the 120% rule for sizing the circuit breaker to ensure the electrical panel (Main or Sub) is large enough to handle your proposed solar system. A quick rule of thumb is a 200A panel can handle a 40A solar circuit breaker, 150A can do a 30A solar breaker, and 100A will allow a 20A solar breaker. Remember to divide by 1.25 to find the maximum allowable current from the utility interactive solar inverter. Install the circuit breaker at the opposite end of the busbar from the Main Breaker, and make sure it’s marked/labeled properly. Derate the Main Breaker – Sometimes you have a situation where you want to land your solar circuit breaker in the panel, but it would violate the 120% rule. Rather than resorting to a line side tap immediately, you can derate the main breaker which frees up more capacity for solar by reducing the other power source feeding the panel. While it adversely affects the overall capacity of the Main Panel, many people aren't fully utilizing their service which can give you some added solar capacity. Line Side Tap – There aren't many rules regarding line side taps. As long as the over current device for your system is less than or equal to the rating of the service, you can tap the conductors coming into the Main Panel. A service-entrance rated solar disconnect (over current + load break protection) should be installed adjacent to this connection. Line Side Taps can be accomplished one of a few ways. 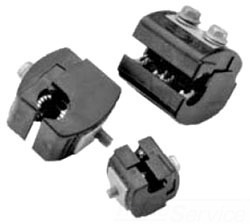 Insulation Piercing Tap Conductors – These devices (pictured below, typical) can be used to make a “hot connection” to the conductors coming into the Main Panel without needing to turn off the electrical service with the Utility. They can be used in a variety of locations in addition to the Main Panel, including exterior wiring gutters or disconnects. Double-Lugged Panels – Sometimes you have a Main Panel that has a double set of lugs for the incoming Utility conductors. If one set of lugs is open, you can use those to perform a line side tap. Parallel Main Panels – Even though it may be rated twice as high, it’s still contained in separate panels with only half the rating. Each panel has to be treated as its own separate entity, the overall service capacity cannot be used as the service rating. Old Panels – Sometimes you have a panel that’s been in service for so many years, it’s gone out of code or the brand doesn't exist anymore. Sourcing breakers for these panels is a major challenge, they have to be UL-listed as a replacement breaker for the obsolete panel. Some panels will be red-tagged by your inspector if you land your breaker in it. In these cases, you will have to do a line side tap or upgrade the equipment. Thanks for sharing great blog.